In this case I’d just like to thank my favourite gal pal Rosie of aredlipandanudeshoe fame for my nomination! 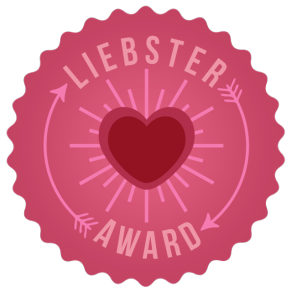 Rosie tells me that the word “Liebster” is German for “dearest” which is very apt because she really is exactly that. Thank you pumpkin! Here are my responses to the questions I was given! 1. Who’s the most famous person you met? And did you wet your pants when you did? I met Christian Slater a few years ago in London’s West End. He was very nice, especially considering I couldn’t manage to string a sentence together. And there may have been wetting of pants, yes. 2. If you were a superhero what would your name be? Dame Judi Dench. Don’t tell me she’s not already a superhero because we all know that’s not true. 3. What’s your biggest challenge with your blog? Keeping the nerves at bay! 4. What’s your favourite item of clothing in your wardrobe? Currently my super skinny jeans from Primark. Cheap as chips and utterly DIVINE. Always cats! They’re so majestic and fluffy. And they usually don’t try to eat your face. 6. If you could travel back in time what year would you go back to? 2012- it was easily my happiest year so far. 1. Who would you say is your greatest female role model? 4. If you could only eat one thing for the rest of your life, what would it be?